The Trump administration is considering a plea from the United Arab Emirates for American military assistance in Yemen, specifically to capture the vital port city of Hodeidah from Iran-backed Houthi rebels, the Wall Street Journal reported Sunday. The port is considered a vital asset for delivering humanitarian aid to the long-suffering Yemeni population. Without American intervention, a drawn-out battle for control of the city will likely become a humanitarian disaster. The debate over increasing U.S. support to the U.A.E. and Saudi Arabia is competing for the attention of top administration officials working furiously to prepare for the planned summit with North Korea in Singapore on June 12. But escalating military operations around the Yemeni port have triggered new urgency in Washington. The U.S. already has special forces units working in Yemen to target al-Qaeda and Islamic State insurgents, and sells weapons to the Saudi coalition, which leads to arguments that America is already culpable for the humanitarian disaster of the Yemeni civil war. The Saudis have been seeking direct U.S. military assistance for over a year. Some proponents of the idea argue that intervening and ending the war quickly would be preferable to letting it drag out and cause more civilian suffering blamed on the U.S. because of its alliance with Saudi Arabia and the other Gulf states. Conversely, ramping down arms sales to the Saudis might prolong the war and damage the alliance with the Gulf states that Trump has carefully cultivated since taking office while doing little to take American fingerprints off the Yemeni civil war in the eyes of its harshest critics. If the U.S. dials back support enough to make the Saudi coalition throw in the towel, it would hand an important regional strategic victory to Iran and give Iranian proxies the ability to threaten shipping off the Yemeni coast, as well as a platform for constant missile attacks on Saudi Arabia. The United Nations considers the Yemeni civil war the worst humanitarian crisis in the world at the moment, with some 22 million people in need of food, clean water, medical assistance, and protection. The blockade imposed by the Saudi coalition is blamed for much of the civilian suffering, although Saudi Arabia and the UAE have also donated almost a billion dollars to the U.N. relief effort and pledged another $500 million. Humanitarian agencies told Reuters over the weekend that thousands of civilians are fleeing Hodeidah as the Saudi coalition and Yemeni government troops close in on the city. “Hodeidah, the so-called big battle, has been looming now for 18 months with ups and downs. It’s a densely-populated area where any military scenario will risk coming at a huge human cost,” warned Red Cross regional director Robert Mardini. 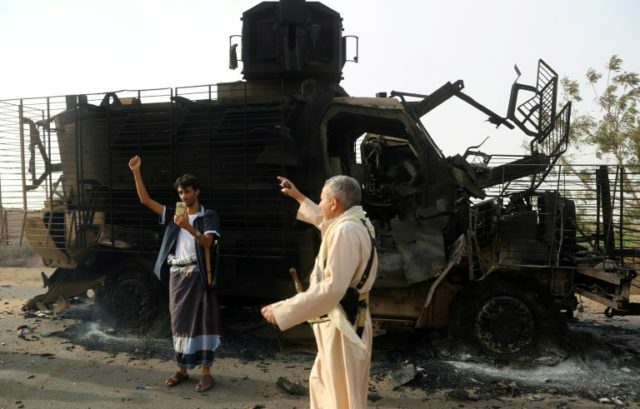 The UK Independent notes that Hodeidah suddenly became a flashpoint for incipient humanitarian crisis because the Yemeni government and its Saudi coalition backers have been making tremendous progress against the Houthis over the past week. The Houthis are expected to withdraw from the port city and fight from the surrounding mountains, which would trap the civilian population in a hellish crossfire. There is a sense that hopes for a diplomatic resolution to the Yemeni civil war evaporated as the Houthis grew desperate; they know the potential for a humanitarian catastrophe in Hodeidah is one of the few bargaining chips they have left, and the tide of the civil war is likely to turn decisively against them if they lose control of the city.